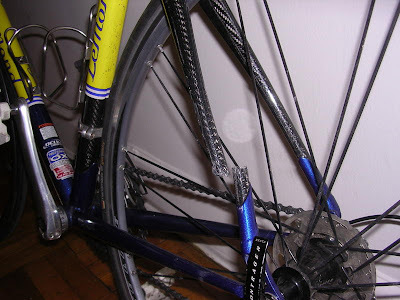 Here is a photo of a broken carbon seatstay – got hit by an oncoming car that turned left into me as I crossed an intersection. By the way, Calfee repaired this and you can’t tell it was broken. i'll second that. Serve me a slice! Gnarly. Hopefully my first generation Easton e-stays will hold up. I think Lemond used Reynolds carbon for their frames too. Not good. I've yet to see a Calfee frame that has broken in normal use. Any busted carbon type photos I've seen of broken Calfee stuff is due to a collision. By the way, I've never owned a Calfee product, I have a Trek.